Although the black and white are entirely different, each has their own way, but as long as mastered a right proportion between the two, they will blending well too, and create a harmonious, clean home environment, and create senses no matter modern or classical easily. White bedroom is pure and warm, express a kind of elegant, simple and noble atmosphere, so many people have a special liking for white home furnishings. White walls, white chandeliers in the white ceiling, white floor lamp bedside as well as white bedding products, etc. these large areas of white tone, creating pure beauty of an overall space. While black bed frame, black stripes on the white bedding cover, a black alarm clock, setting with the black and white series switches and sockets in the wall, all looked exceptionally vivid and lifelike. Worried about too simple black and white will take feelings of cold and lifeless? 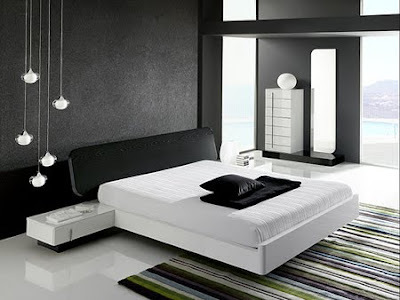 The inclusive nature of black and white allows you to bring a variety of bright colors into your bedroom, white itself is a "super big green leaf," while the match between black and some warm colors can also produce special beauty, for example, wall murals on the wall, a photo frame beside the head of the bed may add warm and lively atmosphere to the bedroom. Now, you must agree that black and white are colors full of spirits, they are colors that never outdated.